Austria has a rich tradition, not only from a historical perspective, but also as it respects the mintage of gold and silver coins. Coins from this Eastern European country are in high demand from both investors and collectors alike. 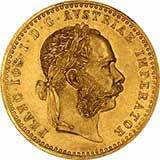 Austrian gold ducats were first minted in 1612 for general circulation, and remained in circulation until 1914. Restrikes of gold ducats were subsequently issued, with a mintage date of 1915. Koronas were official currency of the Austro-Hungarian empire beginning in 1892 through 1918, when the empire was dissolved. Koronas or Krone coins were available in both silver and gold. The Austrian Mint has produced restrikes (official reproduction) of the 100 Corona dated 1915. 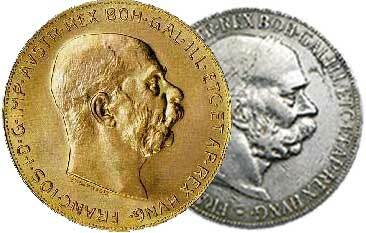 Danish gold and silver coins began production in 1873 and were minted through the late 1910s, when Denmark created a new Kroner currency. Silver kroner coins were minted in denominations of 10 and 25 ¢ (cents), as well as 1 and 2 kroner, while gold kroner coins were minted in 10 and 20 kroner coins. The Peseta was the official currency of Spain from 1869 to 2002. Silver peseta coins were available in 1 and 2 pesetas (with a silver content of 83%) and 5 pesetas (90% silver) until 1910. 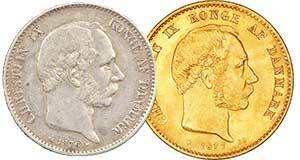 Gold peseta coins were introduced in 1876 and were first available in denominations of 25 pesetas, followed by 20 gold pesetas beginning in 1878. 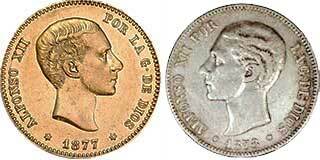 100 gold pesetas had a single year of issuance in 1897. While gold coins for general circulation ceased in 1904, restrikes of 20 gold pesetas with a mintage date of 1887 were minted in 1962 and 1963. Pictured above are 25 gold pesetas and 5 silver pesetas coins. Gold swiss franc coins with a denomination of 20 francs are the most commonly issued gold coins; however, 10 franc coins were also minted for a relatively short period of time. 20 franc gold coins were minted from 1886 to 1949, while 10 franc gold coins were minted from 1911 to 1922. Swiss silver coins are available in denominations of ½, 1, 2, and 5 francs. These silver coins were introduced in 1850 and were discontinued in 1967. 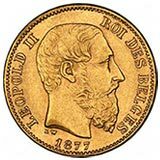 Like their Swiss counterparts, the 20 franc is the most common circulated gold coin of Belgium. Official issues of 10, 25, and 40 francs also exist, but they are relatively rare compared to the more common 20 franc gold coins. Silver coins with denominations of ¼, ½, 1, 2 and 5 francs were first introduced between 1832 to 1834 until 1914, when the government discontinued the use of silver in their coinage. In addition to the above mentioned denominations, 20 and 50 silver francs were also minted between 1933 and 1955.